The posterior portion of the lateral lobes of the thyroid gland is covered with small parathyroid glands. Numbering four, these glands are set in pairs (either superior or inferior). They are a cross between yellow and brown and are sized 3 to 8 millimeters (in length), 2 to 5 millimeters (in width) and 1 ½ millimeters (in depth). When examined under the microscope, the parathyroid glands are made up of two kinds of epithelial cells. These cells are the principle cells and the oxyphil cells. The principle cells are concerned with producing parathyroid hormones. The oxyphil cells assist the principle cells and offer a reserved supply of the hormones from the gland. Blood supply and venous drainage to the parathyroid glands are basically that of the thyroid glands. 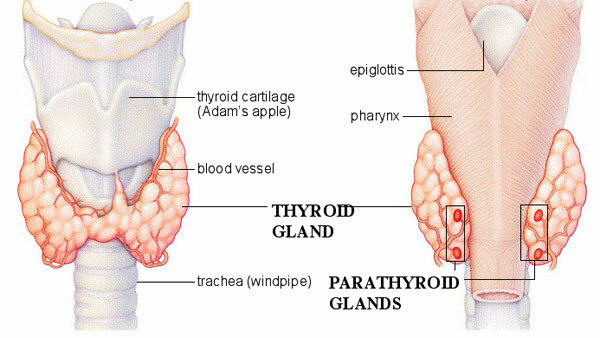 However, the innervation of the parathyroid glands differ from that of the thyroids. Vagus nerves branch into pharyngeal branches to deliver the neurons to the parathyroids. The cervical sympathetic ganglia also drive neurons to the parathyroid glands. The parathyroid glands only secrete one hormone - the parathyroid hormone. A hormone called calcitonin that is designed to decrease blood calcium level is released by the thyroid gland. The parathyroid glands counteract this by secreting a hormone that does the opposite, it raises blood calcium level through working on the small intestines, the bones and the kidneys.